Devex has teamed up with MSD for Mothers — MSD’s $500 million initiative focused on improving the health and wellbeing of mothers before, during and after pregnancy and childbirth — to explore what opportunities are available to the global health community to better engage the private sector and move beyond traditional aid and philanthropy for greater impact. Today, more than 200 million women do not have access to modern family planning. While there are many organizations, initiatives, and efforts being made to address reproductive, maternal, newborn, child, and adolescent health, could more be done to accelerate progress? “As we strive to achieve the Sustainable Development Goals, it is clear that we need more innovative collaboration among government, civil society, and the business community to deliver stronger results for people around the world,” said Dr. Mary-Ann Etiebet, lead and executive director at MSD for Mothers, marking the launch of a new report. 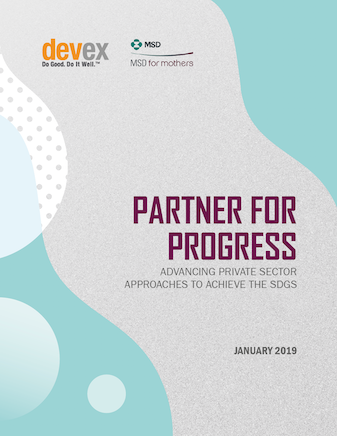 Benchmarking donor investments through private sector funding approaches, Partner for Progress: Advancing private sector approaches to achieve the SDGs, takes a deep dive into the ways to better integrate the private sector in RMNCAH. Monitor funding from 350+ donor sources, find advance information on business opportunities and get insight into big-picture funding trends all from our industry-leading business development platform. Our team provides custom surveys, global development market intelligence and business strategy services that leverage both the Devex network and proprietary development finance data. A social enterprise, we connect and inform development, health, humanitarian, and sustainability professionals through news, business intelligence, and funding & career opportunities so you can do more good for more people. We invite you to join us. If you have questions about the report, please send us a message at info@devex.com. We're happy to help.